The key to the best homemade mashed potatoes is not in the butter, milk, or seasonings. It's all about the potatoes you choose and the way you mash them. Russet potatoes are starchy with a somewhat dry flesh, making them an excellent choice for mashed potatoes. Waxy, low starch potatoes - like the red-skinned varieties and new potatoes - can make delicious mashed potatoes​ but take care not to over-mix, or they could become gummy. A potato ricer is not essential, but it will ensure smooth, lump-free mashed potatoes. But don't fear! Perfect, creamy mashed potatoes are possible with this recipe and helpful tips. If you're looking for something a little different or lighter, take a look at the tips and variations below the recipe. Peel the potatoes and cut them into 2-inch cubes. Put the potatoes in a large saucepan and cover with water. Add 2 teaspoons of salt to the water. Place the saucepan over high heat and bring to a boil. Reduce the heat to medium-low and cover the pan. Continue cooking for about 20 to 25 minutes, or until the potatoes are tender. Meanwhile, just before the potatoes are done, heat the milk in a small saucepan over medium-low heat until hot. Set aside. Drain the potatoes and place the pan over the heat for about 20 to 30 seconds longer, or just long enough to dry the potatoes. Remove the potatoes from the heat. Break the potatoes up with a potato masher. Alternatively, for a smoother texture, put them through a potato ricer first. Add the warmed milk, melted butter, and black pepper. Continue mashing until smooth, adding salt, to taste, and more milk, as needed. Transfer the potatoes to a serving bowl and serve immediately. If the potatoes can't be served immediately, keep them warm in a buttered slow cooker on the low or warm setting. Alternatively, cover the pan and keep them warm in a preheated 200 F oven. Transfer the potatoes to a bowl just before serving. If using red-skinned potatoes, leave the skins on for the extra color and rustic texture. Don't use a food processor or blender to mix the potatoes or you could end up with a gluey mess. A stand mixer with paddle beater attachment may be used, but avoid over mixing. A dash of nutmeg can add extra flavor to mashed potatoes. Replace whole milk with skim milk, or use part stock. Replace the butter with olive oil. Brown the butter before adding it to the potatoes. Use part or all sour cream instead of milk. Add some shredded cheddar cheese, Parmesan cheese, or crumbled blue cheese to the potatoes along with the milk and melted butter. Replace about half of the potatoes with rutabaga. Cubed rutabaga will take about 10 minutes longer to cook, so cook it separately or boil it in a large pot of water for 10 minutes before adding the potatoes. Cutting carbs? Replace one-third to half of the potatoes with steamed, well-drained cauliflower. Cook about 3 to 4 peeled, roughly chopped cloves of garlic along with the potatoes and mash as directed. Garnish the potatoes with fresh chopped parsley. If the stovetop is full, consider using a pressure cooker to cook the mashed potatoes. 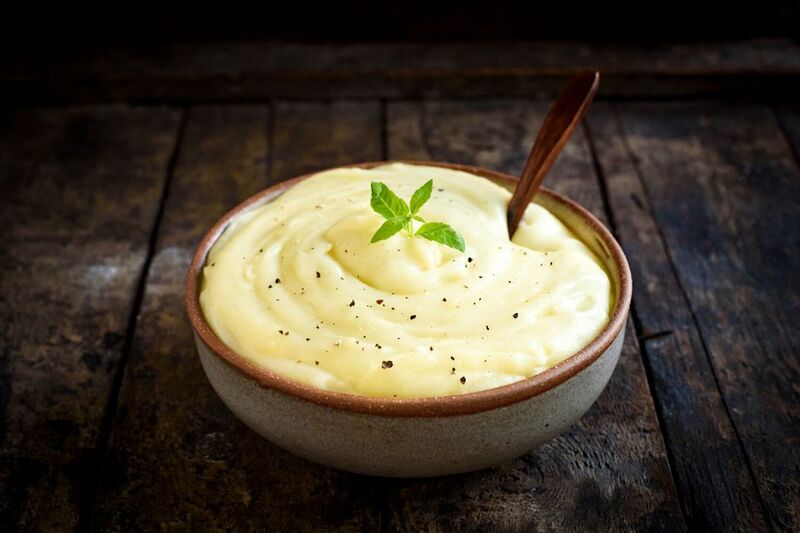 Duchess Mashed Potatoes: Reduce the milk to 1/2 cup and add 2 beaten egg yolks to the seasoned mashed potato mixture. Pipe the mashed potatoes onto baking sheets, making serving-size mounds. Whisk an egg with 2 teaspoons of water and brush over the mounds of potatoes. Bake in a preheated 425 F oven for about 10 minutes, or until golden brown.